The new creation of Renaud Herbin takes as its title a verse of Thomas Stearns Eliot from Four Quartets. At the still point of the Turning world presents itself as a quartet... A dancer, two puppets and a musician stand on the edge of a crowd of long string puppets. A crowd meandering while the compositions of the musician Sir Alice, mixing vocal games, noises and chords of zither, envelop us. 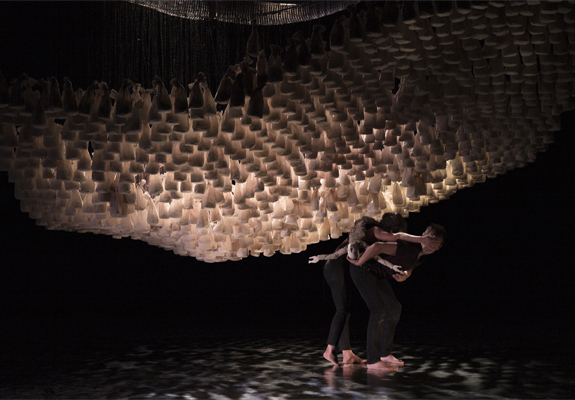 Real sensory immersion, this performance was born from the meeting between Renaud Herbin and choreographer Julie Nioche. Marionnettiste, formé à l’ESNAM de Charleville-Mézières, il met en scène de nombreuses pièces visuelles et sonores, dont il est parfois l’interprète. Directeur du TJP-CDN de Strasbourg - Grand Est depuis 2012, il explore les relations entre le corps, l’objet et l’image, et dialogue avec la danse et les arts visuels.